Trump’s adviser Kellyanne Conway took a beating on social media, being accused of using Orwellian "doublespeak" after she used the phrase "alternative facts" to explain away why the press secretary lied about the size of the crowd attending Trump’s inauguration. 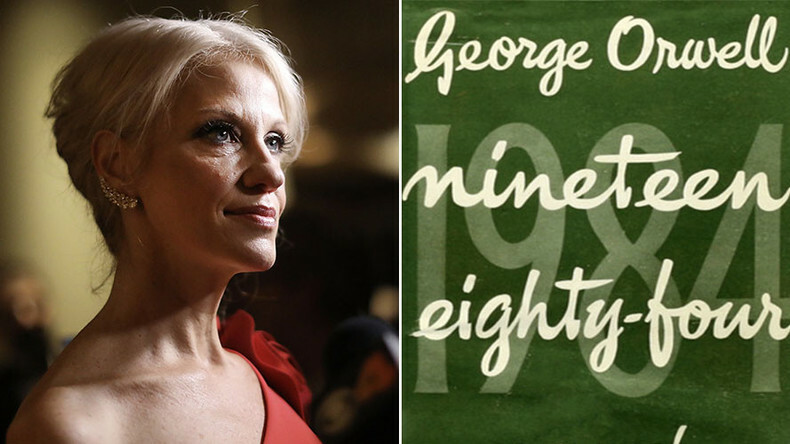 The social media frenzy, with the hashtag #AlternativeFacts compared the remark to ‘doublespeak’ and had the added distinction of moving sales of George Orwell's dystopian novel "1984" to the top 3 of Amazon's bestsellers list by Tuesday afternoon. Alternative facts? Alternative universe. Welcome to the TRUMP propaganda machine. In your face 1984. The surge in sales was first reported by CNN senior media correspondent Brian Stelter in his ‘Reliable Sources’ newsletter. The novel, first published in 1949, but set in the dystopian future of "1984," is about a society in which the government lies to its citizens through "Newspeak," which was designed to limit freedom of thought of the people, and conducted surveillance on its dissenters. The remark was intended to push back at several media outlets which had compared the size of Barack Obama’s inauguration to that of Donald Trump’s, using visual comparisons which seemed to show they were larger for Obama’s inauguration. Media outlets did the same again when the Women’s March against Trump occurred on Saturday.